My lovely blue Chevrolet Blazer. I bought my car off of an individual that no longer needed the vehicle. It's a reliable car. It has a lot of miles. Over 300, 000 miles to be more precise. When I got the car it seemed pretty immaculate inside. The parts were almost all the original parts. The shocks need to be checked as it is a very bouncy ride. The oxygen sensor light has been on since before I owned it. The original owner said he had changed it but it continued to malfunction. The ac only works on the settings three and four. The windows only work when the driver controls them. The passengers cannot open and clothes their windows. The car runs smoothly. It is extremely reliable. The gas can be filled with a little more than 30 dollars. It is good on gas. The rear hatch has to be opened by the button in the console. The trunk cover no longer stays on it tends to come apart and bang around as I take my turns. The ac does get really cold really fast. I love the fact that the seats can be maneuvered to the position that suits you. The best. It is a bit of a short SUV I am 5'7' so I need to position my chair to the furthest from the steering wheel. I really don't like the lighting system as I feel that my headlights are not illuminating the road well enough in the dark. I makes me nervous to drive in the dark. Especially if it raining. I love that my blazer is a 4 door small SUV! With small kids and car seats it is nice to still have space for strollers and groceries. I also love that I do not have a car payment! Things I do not necessarily care for is the maintenance on it. We bought it used and former owner did not take care of it well. Husband does all maintenance on car and it is a bit of a challenge working around motor, as space is rather small. Also not a huge fan that with 2 car seats we can only fit 4 people of vehicle at 1 time. For now it does the job I need and one day will probably upgrade to trailblazer or equinox. Blazer has power seats and windows, cruise-control. It does have a leak so we have to put Freon in it for ac at least once or twice for summer but then it stays really cold! Husband has also replaced intake manifold. But overall not bad for a vehicle that is 16 years old! 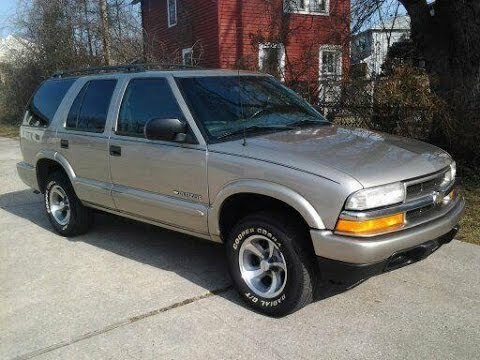 Pros and cons of having an older Chevy blazer. I bought my car used so it came with a lot of problems. Even though it drives great and is super safe if you end up in an accident, it is very expensive to find parts to fix your car to do it being an older model. It is also very safe and reliable in the winter do to it having 4 wheel drive but sometime the wiring needs fixed so it will not kick out. Plus, it sits up higher so it makes it easier to see oncoming problems and traffic. On certain sport utility vehicles, the multifunction switch could develop an open circuit condition that results in the stop lamps and the rear hazard lamps becoming inoperative. The center high mounted stop lamp and turn signal functions are not affected. The loss of stop lamps and rear hazard lamps could fail to warn a following driver that the vehicle is braking and/or is stopped, and could result in a crash. GM has not yet provided a remedy or owner notification schedule for this recall. Owners who do not receive the free remedy within a reasonable time should contact GMC at 1-800-462-8782, Oldsmobile at 1-800-442-6537, or Chevrolet at 1-800-222-1020.